There’s a reason that there has only been three Russian prospects drafted at No. 1 overall in the 50 years of the NHL Entry Draft. The stigma that Russians don’t fit the NHL style and would probably rather play professionally in the motherland, anyway, is a theory that is flowing through every draft expert. It’s easy to see when looking at the elite Russian players in the game today. Nail Yakupov, the first overall pick in 2012, was heard, on record, saying, “I really don’t like skating all the time.” Ilya Kovalchuk signed a massive 15-year contract with the New Jersey Devils and abandoned them after just three seasons. Then there’s the perennial Russian forward, Alex Ovechkin, who recorded a league-high 51 goals — to go along with an infamous minus-39 rating — in 78 games this past season. There are always exceptions to the rule, though. Sergei Fedorov finished his legendary NHL career with a plus-276 rating to go along with two Frank J. Selke Trophies as the league’s best defensive forward. Pavel Datsyuk always finds his name among the top scorers in the league and has already taken three Selke Trophies for his trophy case at home. Exceptions do exist — not every Canadian is a hard worker and not every Swede possesses lightning speed. From the Moncton Wildcats of the QMJHL, Ivan Barbashev. It seems as if another exception is working his way through the ranks. Barbashev, a native of Moscow, has played two seasons with Moncton and has contributed 43 goals and 130 points in 116 contests. 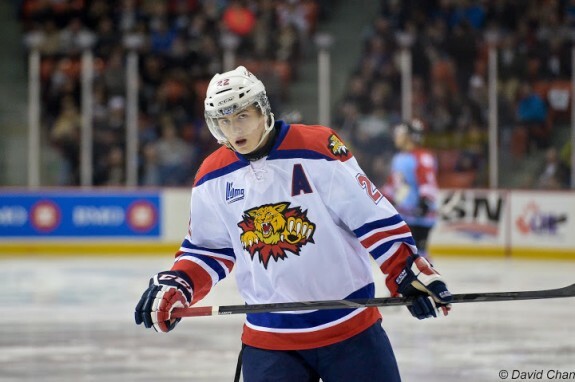 Coming from Europe, Barbashev was looked to be another Russian sniper for the Moncton Wildcats, but his minutes started to get cut, he was moved from his accustomed left wing spot to center, he found himself on the third line, and his coach was asking him to play a more defensive role for the team. While a majority of young Russian players wouldn’t take kindly to this and take the first trip back to the Motherland, Barbashev took it in stride and viewed it as a challenge. He’s been a brilliant two-way player since. Barbashev uses his body effectively to shield the puck from defenders and can create space for himself. His positioning has improved over the season and he seems to know where to be with and without the puck. He’s a battler all around the ice and will use his body and speed to lay some heavy hits when needed. But let’s not forget what makes Barbashev such a prominent draft pick – his offensive skills. Does this mean we have a mini-Datsyuk on our hands? 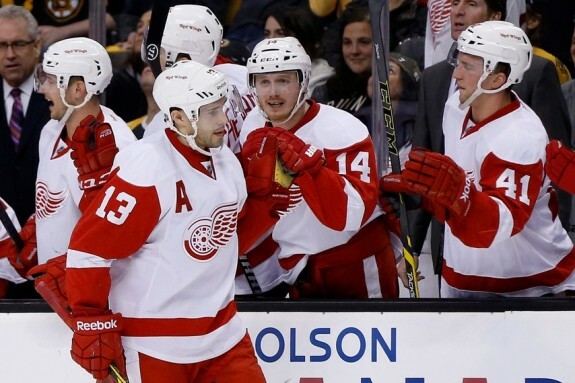 Probably not, as the Red Wings superstar has inserted himself into a class of his own. The potential does exist for Barbashev, though, as his work ethic has allowed him to mold his superior offensive skill with a steady backchecking mentality. The rankings for Barbashev have him going about five-to-six picks before the Blues take the podium. There’s a good chance these rankings stand pat as Phoenix (No. 12), Dallas (No. 14) and Columbus (No. 17) all pick before St. Louis; these are three clubs that could potentially want to grab a two-way forward of Barbashev’s caliber. Let’s not forget that Washington (No. 13) could be seeking another high-end Russian to keep its superstar happy. 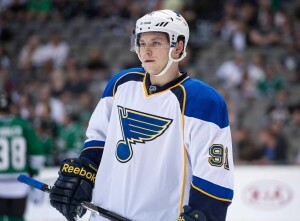 If the Blues can land the 6-feet tall, 180-pound forward with the 21st pick, they may have found a long-time center for sniper Vladimir Tarasenko. If Blues general manager Doug Armstrong feels that filling his roster with a few Russians will keep his superstar-in-the-making happy, its conceivable that the Blues could attempt to pluck an earlier pick to secure Barbashev (pure speculation on my part, of course). Barbashev will hope his skillset continues to improve over time, because it would definitely land him in a top-six role on any NHL roster. For the Blues’ sake, he could grow to be a player that would fit the current Hitchcock system and would receive a long look in training camp as someone who could make the jump to the NHL sooner rather than later. Stay tuned to TheHockeyWriters.com for draft coverage leading up to the weekend of June 27-28. Check out the other parts of this series to prepare yourself for the 2014 NHL Entry Draft!